1 cup peanuts, toasted, about 6 oz. In a large bowl, combine Classico® Light Asiago Romano Alfredo Pasta Sauce, coconut milk, vinegar, soy sauce and sugar. 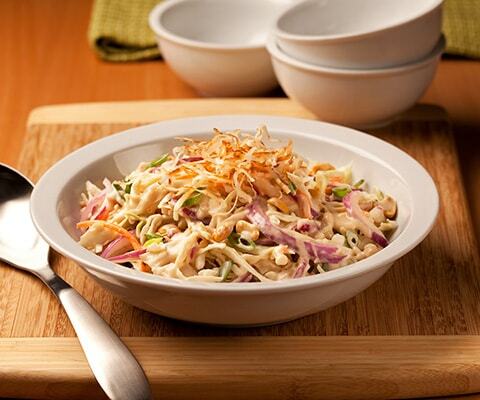 In the same bowl, add cole slaw mix, red onion, peanuts and green onion. Toss to coat and refrigerate for up to an hour. Place in a large serving bowl and sprinkle with toasted coconut. What do you mean by "1 coconut milk"? Is that the milk of one coconut or 1 "cup" of coconut milk? What is it exactly? I am considering trying the recipe but want to be sure of the amount before doing so. Thanks.